What more can be said about Steph? A model citizen on and off the court, he has been the core architect of the revival of the Warriors franchise, and superstar on one of the best teams in the modern NBA era. Long overlooked as a prospect, and then considered fragile early in his career, through his diligent work ethic and faith, he's turned himself into a bonafide global phenomenon. My concept for this release was to celebrate him, the joy he exudes, and those who've birthed him, supported him and celebrated with him, during his rise to stardom. And the fact we get to embrace him as our home town hero. He has changed the game of basketball with his revolutionary shooting, and inspired fans of all ages with a kind, generous and conscientious spirit, touching millions of lives all over the world, breaking stereotypes of the prototype NBA superstar. The photos above give a look at the progression of the artistic vision, from the drawing to the hand cut collage pieces, to the final composition. 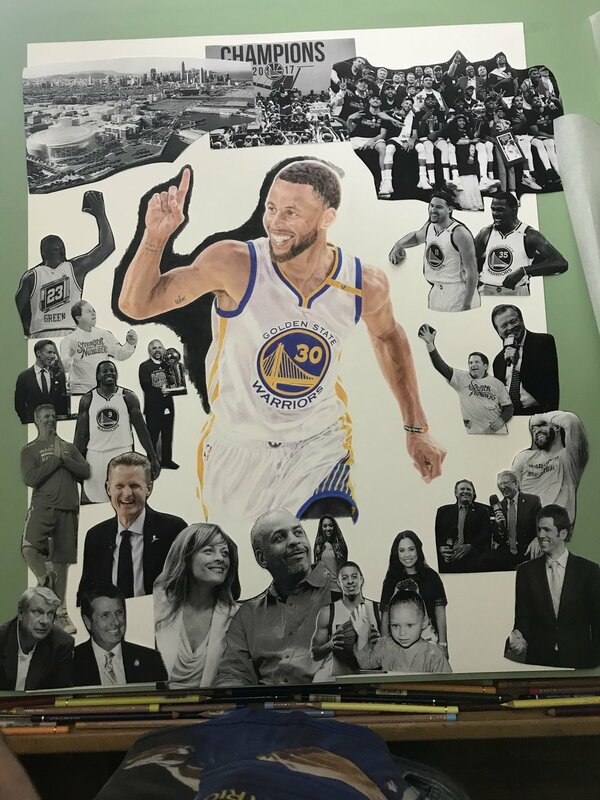 For the final artwork, an archival Giclee print of the collage was printed to size of art (from our photographed composition), then hand cut and glued around drawing of Steph with archival adhesive. Then Sonya Curry wearing it at the 2018 Warriors Championship Parade. This is the 5th in the limited edition player series, the sublimated "Wearable Print" of Yani's original Color Pencil drawing & Photo Collage entitled, "Steph's Joy." Thank you again for your support in taking this sports art/apparel brand to greater heights!